It seems hard to believe it was almost seven years ago when most of us in the poker world first became aware of Jeff Madsen. Of course, his introduction on the scene was so sudden and spectacular, the impression was strong enough to last a long time. 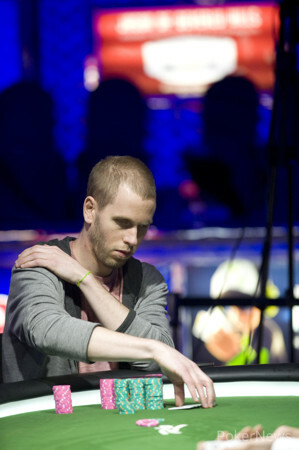 As a 21-year-old Madsen became at the time the youngest ever to win a WSOP bracelet (a record since broken). Then within a week he'd win a second. A third-place finish at yet another event days later helped ensure 2006 WSOP Player of the Year honors for Madsen, and that we'd all be keeping an eye out for him at subsequent events for years to come. Madsen has remained a part of the scene ever since, gathering more than 25 cashes at the Series although never quite getting back to the top. Until today, that is, as Madsen earned his third career bracelet and a first prize of $384,420 here in Event #35: $3,000 Pot-Limit Omaha. Today's final day saw 19 return from the starting field of 640, with Madsen bringing the chip lead to the start of play. 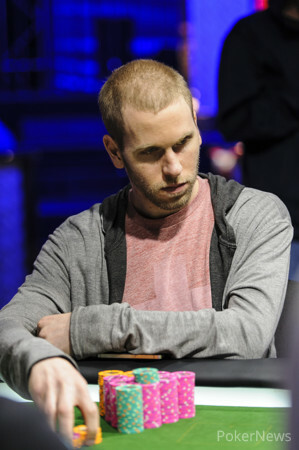 He'd continue to maintain it as they played down to a final table, with Steven Loube (19th), Christian Harder (18th), Jarred Solomon (17th), Mike Sexton (16th), and Ashton Griffin (13th) among those falling shy of the final nine. Madsen kept out in front as the final nine whittled down as well, watching as Douglas Corning took out another two-time bracelet winner, Scott Clements, in fifth after hitting a four-outer to do so. It was Corning who'd meet Madsen heads-up, and in fact for the only time all day Madsen would be in second position, though less than a big blind behind Corning as the pair's stacks were virtually even. But they wouldn't stay that way for long, as Madsen took the lead on the first hand, began increasing it steadily over the next 30 hands, then after a few more finally claimed the last of a short-stacked Corning's chips. 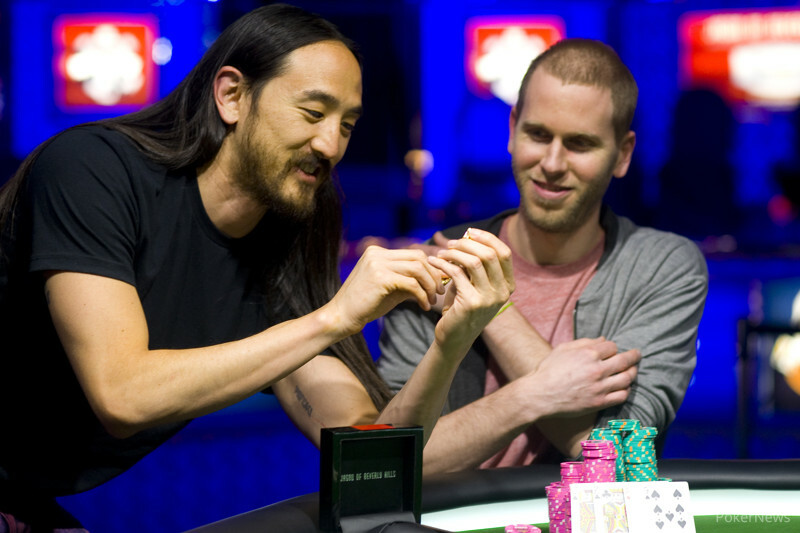 Somewhat uncannily, Madsen becomes the fourth former WSOP Player of the Year to win a bracelet in 2013 along with Tom Schneider, Erick Lindgren, and Daniel Negreanu (winner of the WSOP APAC Main Event). Madsen is presently posing for pictures and celebrating with friends, and perhaps like the rest of us is thinking back to seven years ago when he first grabbed the gold in Las Vegas. Congratulations to Madsen, and thanks to all for following our coverage of his stirring return to the top. Hand #146: Jeff Madsen raised to 100,000, Douglas Corning called, and the flop fell . Both players checked, the turned, and both players checked again. The completed the board, Corning checked a third time, and Madsen bet. Corning called, then mucked when Madsen showed for a diamond flush. Hand #147: Corning raised to 110,000, Madsen three-bet the pot (330,000), and Corning called. The flop fell , Maden bet the pot (660,000), Corning moved all in, and Madsen called. Corning flopped top and bottom pair, but Madsen also had a gut-shot straight draw. The on the turn gave him four more outs to make a straight, and any eight, queen, or jack would give the 2006 Player of the Year his third career bracelet. The spiked on the river, giving Madsen kings and jacks, and eliminating Corning in second place. 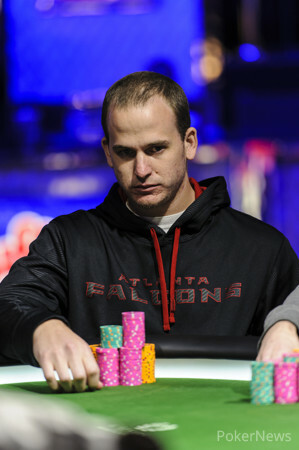 Corning, who finished 11th in the €5,000 pot-limit Omaha event at the 2012 WSOPE, will take home $237,374 for his efforts. Hand #140: Jeff Madsen opened to 100,000 in the first hand of the new level, and Douglas Corning folded. Hand #141: Corning raised to 110,000, and Madsen folded. Hand #142: Madsen raised to 100,000 and won Corning's big blind. Hand #143: Madsen got a walk. Hand #144: Madsen raised to 100,000 and Corning called. The flop came . Corning checked, Madsen bet 130,000, and Corning called. The turn was the and both players checked. The river then brought the and a bet of 180,000 from Corning. Madsen riffled his chips and considered for a few seconds, then tossed away his hand. Hand #145: Corning raised to 110,000, and Madsen folded. Hand #135: Douglas Corning raised to 90,000, Jeff Madsen three-bet the pot (270,000), and Corning folded. Hand #136: Madsen raised to 90,000, and won the pot. Hand #137: Madsen received a walk. Hand #138: Madsen raised to 90,000, and Corning folded. Hand #139: Corning raised to 90,000, Madsen called, and the flop fell . Madsen checked, Corning continued for 125,000, and Madsen folded. Hand #131: Douglas Corning raised to 90,000, Jeff Madsen called, and the flop came . Both checked, then the turn brought the . Madsen checked again, and when Corning bet 80,000, Madsen called. The river was the . Madsen bet 140,000, and Corning called. Madsen flipped over for tens full of queens, and Corning mucked. Hand #132: Madsen raised to 90,000 and Corning called. The flop came , and both checked. The turn was the , and both checked again. The river was the . This time Corning led for 125,000, and Madsen deliberated for a few moments as he counted out the calling chips. Finally he tossed forward the chips, showing for a small flush, and Corning folded. Hand #133: Corning raised to 90,000, and Madsen called. The flop came . Madsen checked, Corning bet 120,000, and Madsen folded. Hand #134: Madsen raised to 90,000, and Corning called. The first three community cards were single-suited, coming . Corning checked, and Madsen bet 105,000. Corning responded by check-raising to 230,000 total, and Madsen folded. 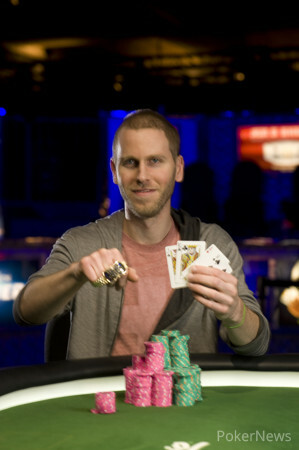 Hand #126: Jeff Madsen had the button, and raised to 90,000. Douglas Corning called, the flop came , and Corning checked. Madsen continued for 110,000, Corning called, and the turn was the . Corning checked again, Madsen fired out 225,000, and Corning folded. Hand #127: Corning raised to 90,000, and Madsen folded. Hand #128: Madsen raised to 90,000, Corning defended, and the dealer spread . Corning checked, Madsen bet 105,000, and Corning folded. Hand #129: Corning raised to 90,000, Madsen defended, and the flop came . Madsen checked, Corning checked behind, and the turn was the . Madsen led out for 135,000, and Corning folded. Hand #130: Madsen raised to 90,000, Corning called, and the flop fell . Corning checked, Madsen continued for 105,000, and Corning called. The turn was the , both players checked, and the river was the . Corning led out for 135,000, Madsen raised to 315,000, and Corning folded. Hand #123: Douglas Corning raised to 90,000 from the small blind/button, and Jeff Madsen called. The flop came , Madsen checked, Corning bet 120,000, and Madsen called. The turn was the and Madsen checked again. 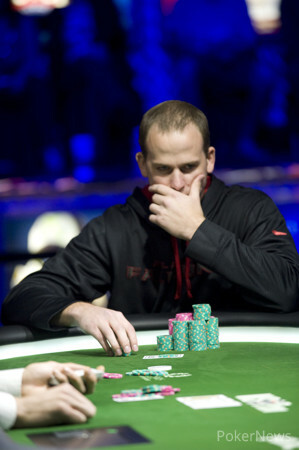 Corning held his left hand over his mouth, then with his right pushed out a bet of 280,000. Madsen called. The river then brought the . Both checked, and when Madsen showed for trip jacks, Corning folded. Hand #124: Corning got a walk. Hand #125: Corning raised to 90,000, Madsen called, and the flop came . Madsen checked, Corning bet 120,000, and Madsen called. Both checked the turn. The river was the , and Madsen led this time for 235,000. When Corning called, Madsen immediately mucked his hand even before Corning showed. Corning then tabled his and scooped the pot. Hand #116: Jeff Madsen raised to 90,000 on the button, Douglas Corning defended, and the flop fell . Corning led out for 120,000, Madsen raised to 275,000, and Corning folded. Hand #117: Corning raised and Madsen folded. 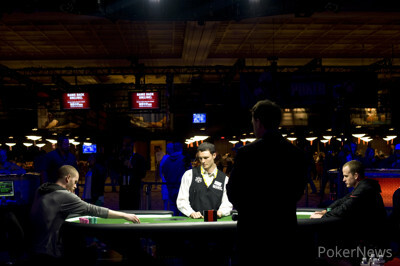 Hand #118: Madsen raised to 90,000, Corning three-bet the pot (270,000), and Madsen called. The dealer fanned , Corning led out for 200,000, Madsen raised to 475,000, and Corning folded. Hand #119: Corning raised to 90,000, and Madsen folded. Hand #120: Madsen raised to 90,000, and Corning folded. Hand #121: Corning raised to 90,000, Madsen three-bet the pot (270,000), and Corning folded. Hand #122: Madsen raised to 90,000, and Corning surrendered his big blind.